I made a vegan apple crisp recipe I found on The Post Punk Kitchen's site (new and improved! check it out!). I don't like raisins all that much and was fresh out of arrowroot powder so I used cornstarch, but otherwise, I followed the instructions and ingredients to the letter. Admittedly, I'm my own worst critic, so I thought this recipe was just ok. Growing up, my mom never ever EVER used sugar in recipes. She used honey instead, and I think I'm more accustomed to what apples taste like when they're mixed with honey - not gobs of white sugar. BUT...I made this for some dinner guests and they gobbled it up, so I have to believe that if you're a fan of cooking apples with sugar, you'd like this recipe. 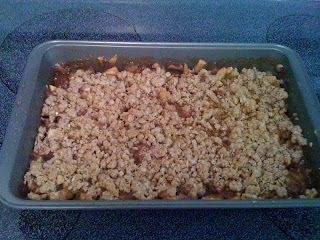 I think I'd make this vegan apple crisp again, but maybe I'd try to use agave instead.